Fan and humidifier combos offer several of the most beneficial – and cost-effective – ways to cool a room, improve the humidity, and make a room more comfortable. They use only a tiny fraction of electricity vs an air conditioner. But which ones are actually worth buying? And what are the details you need to be aware of when comparing different models? In order to help you make a smart buying decision I’ve put in the time, research, and testing to help. Here you’ll find 5 of the best fan and humidifier combos available today. 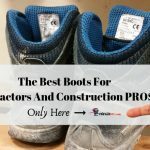 Be sure to check out my Editor’s Choice top picks for the best overall values that won’t let you down. 1.1 1. Honeywell CO30XE – Some of the best air cooling, fan, and humidifier performance I’ve reviewed yet. 1.2 2. 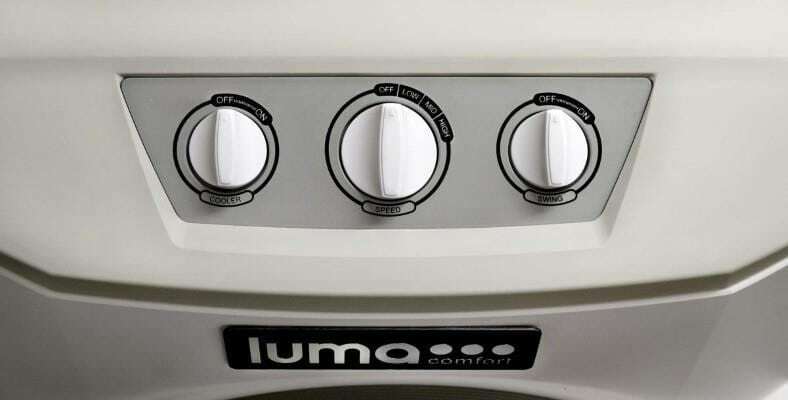 Luma Comfort EC220W – A real performer! Powerful cooling and humidification for up to 650 sq. ft.
1. Honeywell CO30XE – Some of the best air cooling, fan, and humidifier performance I’ve reviewed yet. 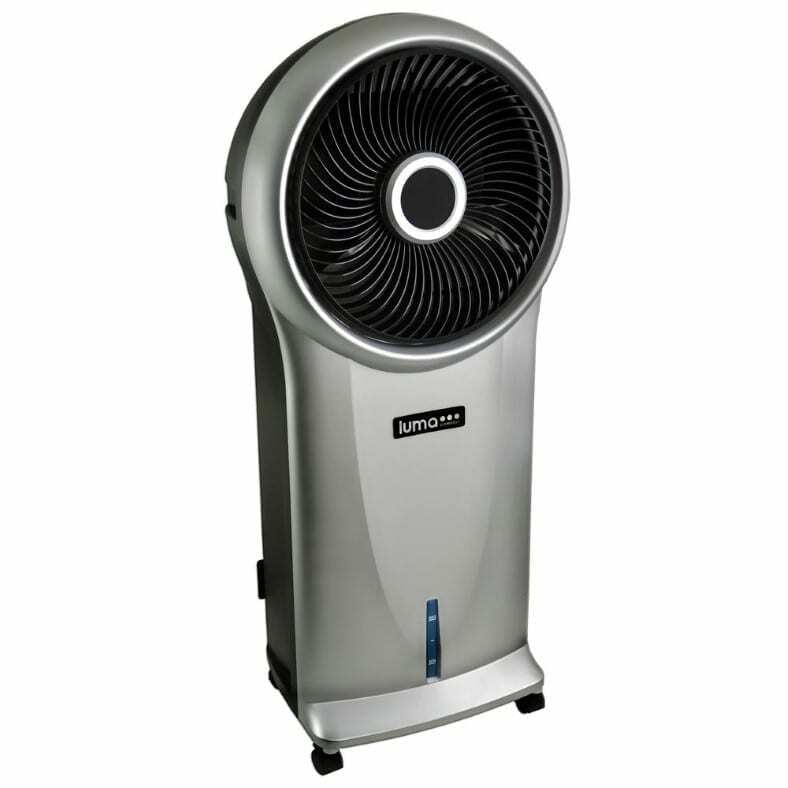 The Honeywell CO30XE evaporative cooler, fan, and humidifier provides up to 525 cubic feet per minute (CFM) of comfort. It comes with lots of great features built in, too. It’s excellent for medium-size rooms up to 320 square ft (30 square meters) in size. It’s not just a fan or simply a humidifier, but an effective way to stay cool, too. Much like a real breeze from nature, the powerful fan feels just like a wonderful gust of wind from across a lake. It’s that nice! 4 fan modes are available: Low, Medium, High, and Natural. Set it to Natural mode and the unit randomly oscillates and changes fan speed to simulate a real breeze. How cool is that? Even better, it’s weather resistant, meaning you can also use it outdoors for barbecues, gatherings, or just lounging comfortably on the porch. Controls for the CO30XE are easy to use and clearly labeled. It’s a great design I really appreciate, and you will, too. You can easily control cooling, oscillation, the timer feature, and more with a push of the button. The panel also lets you know when your water supply is running out as well. The controls are some of the best I’ve seen on a combo fan/humidifier cooling unit. Most on the market are “ok”, but Honeywell, once again, sets the bar higher. Electronic pushbutton controls run all functions and a simple but clear indicator display tells you the status of both the current mode and the water tank status (low or ok). An auto-off timer feature allows you to set it and forget it. Choose from 1/2, 1, 2, or 4 hours of carefree operation. The Honeywell provides even more features! There’s a handy remote control included (for all major functions you need). For excellent cooling with the electricity costs of an air conditioner, add ice to the provided top compartment. It’s an inexpensive way to cool out for less! One fantastic feature I love is the included remote control. It lets you operate all the major functions at your convenience. No need to get up! You can get even cooler air by using the provided ice compartment on top. By adding ice you can bring the temperature down even further and chill the room nicely. The attached water tank is removable for easier cleaning or water filling or use the side water fill opening. Rollers are located on the base making easy to move it anywhere you need it. 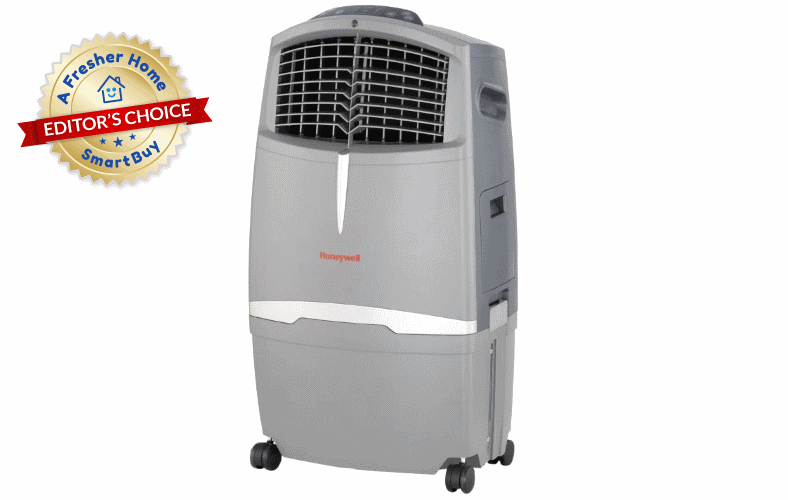 The Honeywell CO30XE is a well-made, well-performing fan, air cooler, and humidifier. The features are simply better than much of the competition. 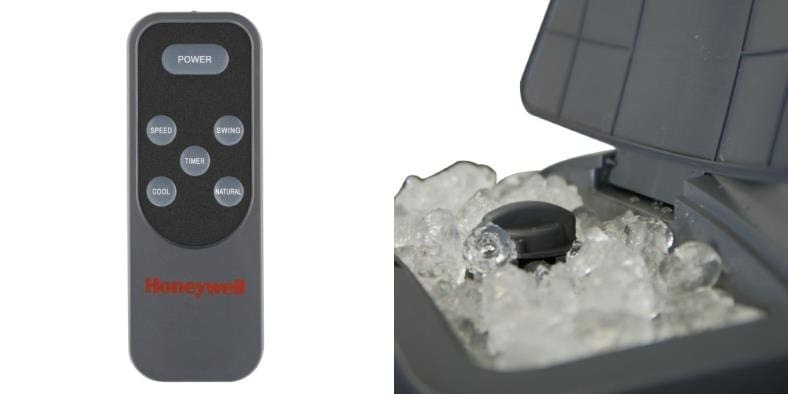 The Honeywell quality really seals the deal, while being able to use it outdoors is a definite plus in my opinion. Want one of the best? Here it is! Have a look at the excellent features I mentioned and many happy reviews over at Amazon now. 2. Luma Comfort EC220W – A real performer! Powerful cooling and humidification for up to 650 sq. ft. 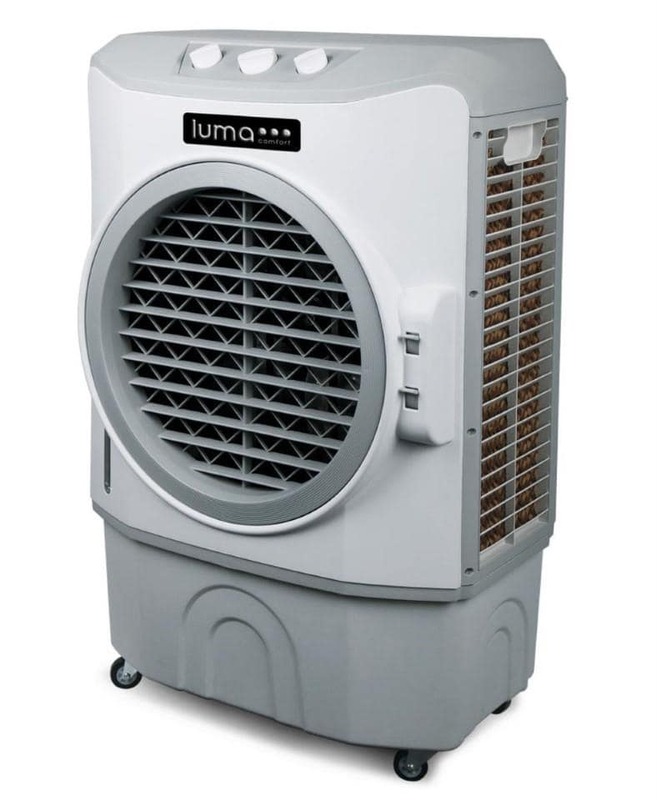 The wonderful Luma Comfort EC220W fan, air cooler, and humidifier combo is an excellent choice for homes or many other areas. It works great as an air cooler, tower fan, and humidifier – all in one! 3 cooling speeds and wind modes control which way the comforting breeze blows to get you comfortable in even the hottest environments. The EC220W provides a whopping 650 square feet of cooling coverage. For an added cooling boost you can also drop ice into the water feed if you like. 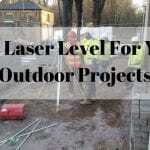 It’s also simple to use and one of the most effective on the market as well. (Left) The Luma Comfort fan/cooler/humidifier combo has both a fill opening for water fill up and a direct water hose connection as well. (Right) A convenient water level indicator provides easy viewing from the front. It’s also easy to refill, but the great news is you won’t have to do so often thanks to the 10 gallon water tank. When it’s time to refill, just use the rear water fill opening or you can even connect a standard water hose if you like. The evaporative cooling process the fan and humidifier combo provides requires many times less electricity than air conditioning. The powerful fan blows and cools using the internal water pads. No chemicals or added expenses are needed! Controls are clearly labeled and easy to use – it’s one of simplest I’ve run across. 3 controls are provided: cooling on/off, fan speed, and fan swing (oscillation). You can also adjust the airflow direction manually. Despite being one of the best on the market, it’s also one of the simplest to use anywhere. 3 fan speeds are selectable (low, medium, and high) along with the cooling on/off feature. You can also switch on the optional motorized fan oscillation feature to distribute soothing, cool air across the room. Measuring 27.4 x 17.2 x 41.3 inches in size and about 41 lbs, it’s not a small unit. It’s a great fit for cooling or humidifying your home, warehouse, greenhouse, and anywhere you want powerful and effective humidity, air, and cooling. I do have a few minor complaints, however. I wish a auto-off timer feature was built-in and a remote as well. Those are both features you’ll find in some of the competing lower-priced products. If you’ve got the budget, this one’s a winner! What I like about is how well made it is and that it reallydelivers.